He is the greatest goaltender who ever played for the Vancouver Canucks. He’s in the top-five goalies to ever play in the NHL. And when Roberto Luongo returns to Vancouver with the Florida Panthers on Sunday, playing what could be his last game in front of Canucks fans, you can expect people to give him the salute he deserves. Because to this day, five years after his trade back to Florida, the connection with this city’s fans is still there, with feelings as fresh as if he played here yesterday. When he does decide to call it quits, whenever that happens, the Canucks must give him the salute he deserves too – the only one suitable for a player of his ilk: the ceremony reserved for the best, the elite, the select few. The Canucks need to retire Luongo’s number. The supporting evidence for this is vast. With five more wins, Luongo will sit third on the all-time list for total wins by a goaltender in NHL history, behind only Martin Brodeur and Patrick Roy. Like Brodeur, Roy, and the goaltender he’s about to pass Ed Belfour, Luongo will be in the Hall of Fame one day. His .919 career save percentage is tied for the highest of anyone in the top-10. When reflecting on Luongo’s career, sure you think about Florida – he has spent 10+ seasons there – yet it’s the image of him in the Canucks blue and green during his eight seasons in Vancouver that’s most vivid. The list of records Luongo holds for Canucks goalies includes most wins (224), most shutouts (33), and the longest shutout streak: 242:36 minutes (that’s four straight games without allowing a goal! ), and that’s just a few. After his first year in Vancouver, Luongo was a finalist not only for the Vezina Trophy, but for the Hart Trophy and Lester B. Pearson Award as well. Think about that for a second – nominated for those three awards, his impact on the team’s results was arguably greater than Elias Pettersson’s is to today’s Canucks. Another Canuck he could be compared to, and this may be a surprise at first, is Pavel Bure. Luongo, during those stretches of invincibility he had so often, was every bit as dazzling to watch as one of the league’s most exciting players ever. Recall that first year in Vancouver, when he not only carried the team on his back to the playoffs, he singlehandedly pulled them through the first round against Dallas – three games went to overtime – and took Anaheim, the eventual Cup champions, to two overtimes in Game 5. 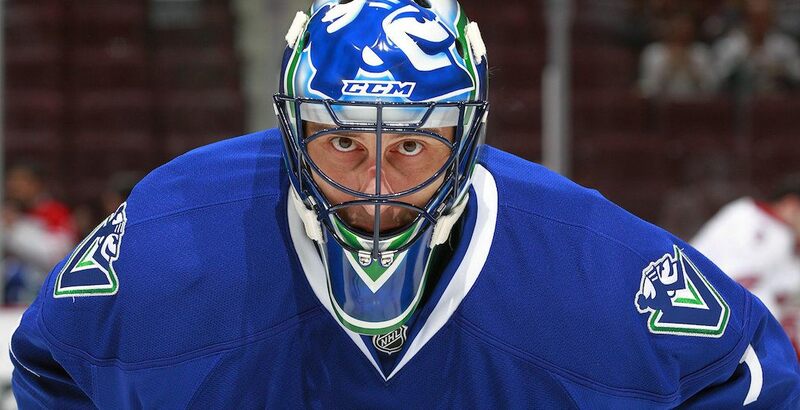 Luongo had that Bure-esque ability of making jaws drop many times each game. He made hearts stop. He forced fans on to their feet to cheer. It’s one thing for the league’s fastest skater to command an entire fanbase’s attention with a play, but for a goalie who operates in a five-foot radius, robbing opponents of sure goals, forcing fans to yell his name, it is truly remarkable. Luongo was one of the three pillars of the greatest Canucks team of all time – a team that won two Presidents Trophies and came within one game of winning the Stanley Cup. There’s no doubt the Sedins and Luongo were the team’s three leaders, it’s heart and it’s core. Now, with his trade back to Florida a distant five years in the rearview mirror, Luongo’s legacy in this city has to be appreciated. Stan Smyl, Trevor Linden, Markus Naslund, Pavel Bure, Daniel and Henrik Sedin – that is the class he belongs to in terms of all-time Canucks. The best, the leaders, the all-time fan favourites. There is no doubt Luongo is all those things.